This week is gonna be good times at the Jolly Jabber! 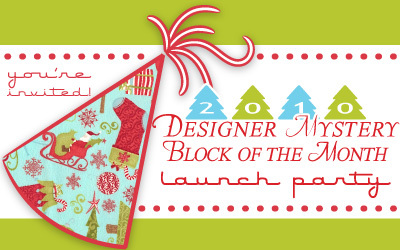 We're celebrating the launch of our 2010 Designer Mystery Block of the Month, so party hats on! For the past three years, we've been birthing this sweet baby called Designer Mystery. Each year, it's a crowning glory, a prized jewel, our little darling, and yes, like anything worth birthing, sometimes an insolent teenager. But each year it grows up to be a beautiful/fantastic/brilliant quilt, and then several months down the line, you all get to see and partake! The very first block, designed by Gudrun Erla of G.E. Designs (*looks around* I think I can tell you that much without getting in trouble, but if anyone asks, you didn't hear it from me), is now in the hands of many a member, and that's what we're celebrating all week! And everyone's invited to party with us! In fact, some of y'all have already finished your blocks (you Speedy McSpeedersons) and have added them to Kate Spain's 12 Days of Christmas Flickr Pool, i.e. Sherri's! Haven't signed up yet and want to know more? You can still join! 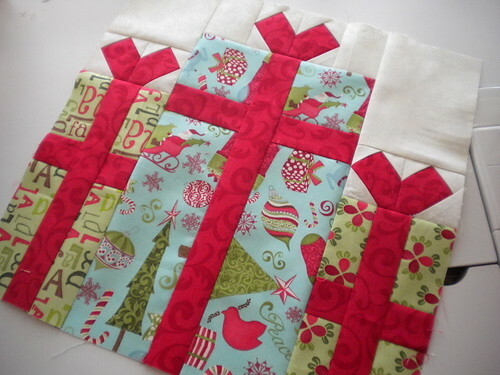 Never mind if you've never done a BOM before or are new to quilting -- you CAN do this :) We've designed it for every skill level, and each block is a cute little surprise of its own! Leave a comment today and be entered to win these goodies...one comment will be selected at random to win 2 patterns by each designer! And "Three Barns" quilt pattern and "Sweet Liberty Tuffets" pincushion pattern by Miss Rosie's Quilt Co. Winners of today's prize batch will be announced on Wednesday...along with part 2 of the 2010 Designer Mystery BOM Launch Party!